As I've written before, Moria is the next army I'm going to be work on (I'm also going to take a slight Hobbit detour but that's still Moria). I started with the bigger denizens of this realm (see earlier posts) and followed with this small team of 8 metal Goblins. Those are some of the first miniatures released for LotR: SBG but I think that they still look as good (or even better) than some of the newer ones. Since they hardly ever get to see the sunlight and spend most of their lived deep underground, I chose a very dark color scheme. It gave me an opportunity to use the new GW paints for the first time. I bought two base and one layer color for their skins. I started with a basecoat of Castellan Green, highlighted it with Death World forest and gave one more very bright highlights on the protruding areas (noses, cheekbones etc.) with Ogryn Camo. They looked a bit too pale at this point so I started glazing the skin areas with brown inks, giving them a darker, dirtier look. The armors were painted pretty much the same way I did with the Morannon Orcs. 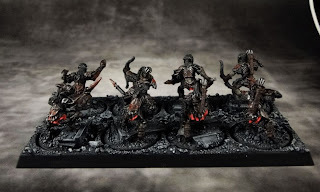 Dark and rusty - I think it goes well with the character of these guys. The bases have fragments of walls/ruins and lots of gravel. 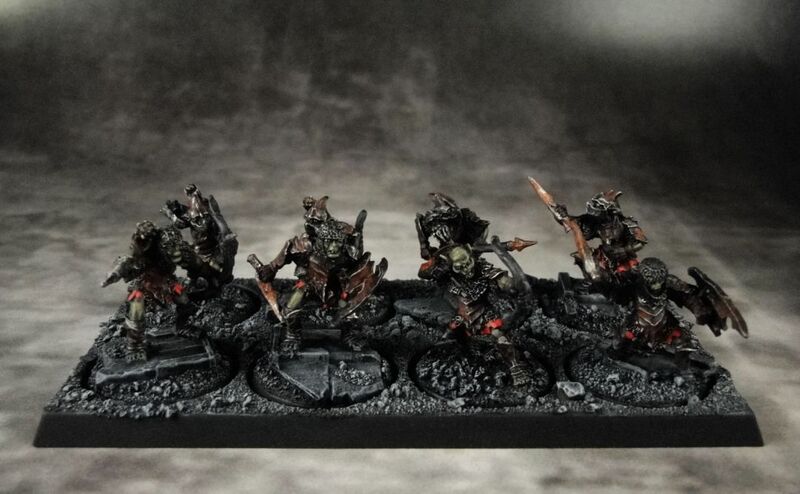 I didn't go over the board with details on these as I thought that a fairly plain look would work better in creating the feel of a wild horde roaming the dark places. I think in this case simplicity is the right choice. They look great. Nice basing too.